Keywords: —Information and communication technology, human computer interaction, Internet, information retrieval, farming, Agriculture information system, iconic interface. The availability and accessibility of information are the crucial points in taking the optimal decision at right time. 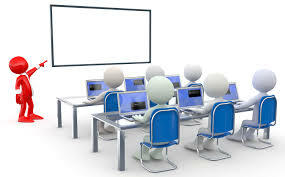 Nowadays, advancement of ICT make possible to retrieve almost any information from the global repository so, they are unable to access required information on the Farming life cycle, seed selection, pesticides, etc. from the internet. As a consequence, they are not capable to take optimal decisions at different stages of farming life cycle, which make huge impact on the farmers revenue. Developed interface for the Indian farmer community to access the agricultural information from the global internet repository and store them into local repository. The proposed interface is critically evaluated with the farmer from different states of India. The evaluation results proved the effectiveness of the proposed interface. User can only interact with the system through icons and results back with their intended agricultural information in Indian language. To access the intended agricultural information from internet and local repository, users have to form proper query. The query is generated by selecting the corresponding icon(s) displayed in the interface. We proposed to develop an iconic interface which is integrated with interaction in Indian languages. The proposed interface is critically evaluated with the farmer from different states of India. We have also included a feature of weather forecasting which will help all the farmers to work according to weather prediction and get a fruitful results. With respect to this farmer got an amazing option of predicting the future lines of production based on previous data and history populated in the system. So system will gain knowledge about the process and ins outs once farmer feeds in their previous experience. Now a days our main source of health that we getting our farmer they are not getting information related to weather and government schema. In this proposed we have to implement a system to have an effective vegetable production, weather production and production prediction so farmer can farming safely and produce best product. This proposed system also provide iconic interface which is used to provide easy communication between farmers. This also provides the notifications of governments newly released services for farmers and also provides a banks loan details information. The hashing algorithm usage a hash function for different functionalities like Bloom filters, Finding duplicate records, Protecting Data, Finding similar records, Geometric hashing and so on. The hash function is a function that can be used to map data of arbitrary size to data of fixed size. Hash function accelerate table or database lookup by detecting duplicated records in a large file. The hash table map several different keys to the same index. The hash function contains a set of records, rather than a single record. The hash function are used to build caches for large datasets stored in slow medium. This is also used in file comparison. This hash algorithm is used for finding a duplicated records and avoid them. This is also used in system when user enters a User id or Password for registration. It avoid repetition by giving alert of same registration. We have created android application in ADT (Android Development Toolkit) bundle. We proposed mobile application for farmer where farmer can check production prediction, weather detail, market rates and information related to fruits, vegetables and crops. In this application farmer can also get notifications and updates of government policies related to farming. Information related to bank and farmer loan can also be retrieved by this application. In future, we can incorporate other multiple Indian languages like- Bengali, Tamil, etc. with Krishimitra interface. We can also includes text to speech translation and we can also add video links for farmers easily understanding. An krishi-mitra interface to accessing the agricultural information from the global repository of internet and the local repository has been proposed in this paper. 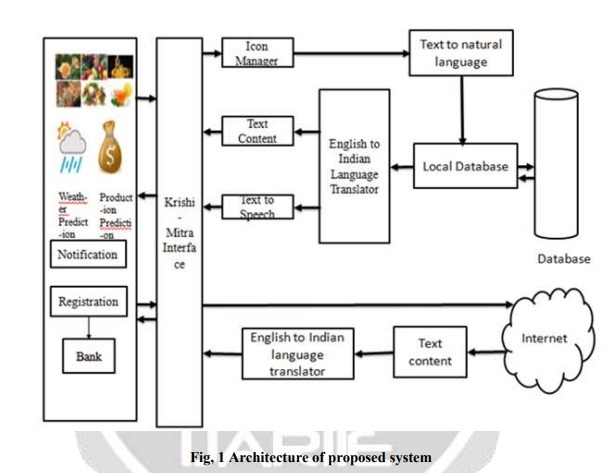 The proposed interface is able to overcome the digital and language confinement of the Indian farmers by employing the multiple modes of interaction techniques. The empirical evaluation through large diversified users reveals that the Krishimitra interface adequately caters the need of the user. It also be concluded that the proposed interface is very much usable, applicable in the desired context. At the current stage the Krishi-mitra interface is limited to access the agricultural information in the context of Indian languages. However, it can be extended toward the agricultural context of any country in the world, which proves that the approach is generic. This system is for Farmers who can easily access the government policies and also they can gane more information about crops. And also it would be easier for them to decide which crop to be grown in order to get productive results with the help of weather prediction as well as production prediction. 1) L. N. De Silva, J. S. Goonetillake, G. N. Wikramanayake, and A. Ginige, “Towards using ICT to enhance flow of information to aid farmer sustainability in Sri Lanka,” in ACIS 2012: Location, location, location: Proceedings of the 23rd Australasian Conference on Information Systems, pp. 1-10. ACIS, 2012..
3) R. Prasad, K. R. Ranjan, and A. K. Sinha, “AMRAPALIKA: An expert system for the diagnosis of pests, diseases, and disorders in Indian mango,” Knowledge-Based Systems, 19(1), pp.9-21. Elsevier,2006. 4) Punchihewa, Devaka J., and Prasad Wimalaratne. "Towards an ICT Enabled Farming Community." EGovernance in Practice, India (2010): 201-207.